Ferrets are very social and need daily time out of their cages for exercise. Thorough and thoughtful ferret-proofing is an absolute necessity. When approaching ferret-proofing, remember that ferrets are very curious, will chew and swallow things, love cozy enclosed spaces, and have flexible bodies that fit through very small openings. Ferret-proofing is an ongoing task, rather than a one-time chore. No matter how thoroughly you ferret-proof, you should still carefully supervise your pet ferrets as you never know what they might try to get into next! Keep an eye on what your ferrets want to get into, and make adjustments as necessary. These are some general ideas to remember when ferret-proofing your home. If it is feasible, a good way to ferret proof is to have a single room that is completely and fully ferret-proofed, in which you can let your ferrets romp with the door shut to block access to the rest of your home. If this is not possible, you can ferret proof a larger area but try to block access to the kitchen, bathroom and laundry room, as these are areas that are harder to ferret-proof. Make sure your ferret cannot get outside. A ferret can easily tear through a window screen, so keep windows closed at play time if your ferret can reach them. 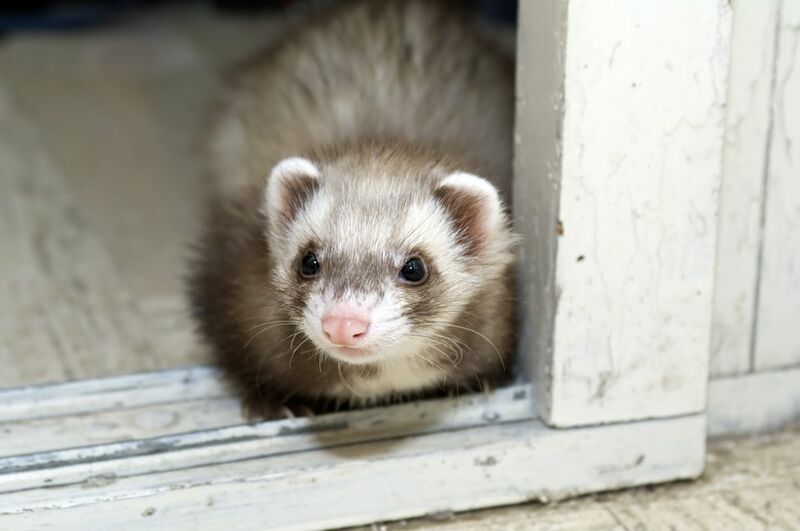 Ideally, make sure that when your ferrets are out, they cannot get to doors that lead to the outside. If someone inadvertently opens a door, your ferret might dart out; at the very least lock the doors when ferrets are playing. You should also check for any small openings to the outdoors (e.g. around plumbing, the dryer vent, etc) and make sure the ferret can't get out under doors. Remember, ferrets can squeeze through amazingly small spaces. Ferrets can easily fit under most appliances and can then get up into the workings of the appliance, which can be dangerous if the appliance is turned on or if the ferret finds access to electrical wires. Additionally, ferrets are very attracted to baskets of laundry, and could inadvertently be put in the washer (or dryer) with a basket of clothes. A ferret that makes his or her way into the dryer vent duct now has an escape hatch! If your ferret has access to these rooms, you must find a way to block off the undersides and backs of the appliances, and you must double check the interiors of all appliances before using them or closing them. Furniture is another favorite of ferrets for getting under and then climbing up into the inner workings. It is a good idea to tightly staple heavier fabric to the undersides of box spring mattresses and couches and chairs, as ferrets can easily get through the flimsy fabric often used here. Recliners are very dangerous to ferrets, as the reclining mechanism can trap and severely injure a ferret hiding under the chair. Similarly, rocking chairs are a bad idea around ferrets. You also need to check couch cushions before you sit down as ferrets may burrow under or even into them. Cushions should also be checked in case the ferrets are getting into them and chewing on the foam (a danger for intestinal blockages). A common medical problem is blockages in the digestive system from something a ferret has swallowed, especially in kits. Ferrets will chew up and even swallow a surprising variety of items, but things like foam, styrofoam packing, soft rubber toys, neoprene, erasers, elastic bands, and rubber squeaky toys are among the most problematic. Indigestible items swallowed by ferrets can block the digestive system and require surgery to remove. You must also watch that your ferret does not ingest toxic substances, like cleaners, poisonous plants, medications, etc. The following list is a good starting point for ferret proofing, but is not totally comprehensive. You will need to watch your ferret carefully in your own home to truly identify all the ways you need to ferret-proof your home! Appliances - Restrict access to laundry and kitchen if possible. If not, block off around appliances (fridge, stove, dishwasher, washer, dryer, freezers) so that ferrets can't get under them or into the workings (e.g. where the motor or wires are located). Double check for hiding ferrets before turning appliances on or shutting their doors. Laundry baskets - Double check the laundry before putting in washer or dryer. Dryer vents - Secure the dryer duct (watch for chewing into the duct) or your ferret may use it to get outdoors or into the dryer. Air ducts - Ensure your ferrets cannot get into the heating/air ducts or they might get stuck, injured, or end up outdoors. Boxspring mattresses - Securely cover bottom with heavy fabric or wood to prevent ferrets from climbing into the​ boxspring. Recliners - Always make sure your ferrets are nowhere near the mechanisms when using recliners, or better yet, do not use them when your ferrets are out. Rocking chairs - It is best to avoid these when ferrets are out. Couches, chairs - Secure the bottoms to prevent ferrets from getting under and up into the furniture. Also check under the cushions before sitting, to make sure a ferret isn't napping under them. Using slipcovers will prevent ferrets from burrowing into the cushions. Periodically check couch cushions, furniture, and pillows for signs of chewing. Small spaces - Make sure there are no small spaces through which your ferret could get out of the house or into the walls. Remember, if they can get their heads into a crack, their bodies can usually follow. Especially check around cupboards, plumbing, ducts, doors, etc. Under doors - Watch for large spaces that ferrets can get through. Also, to prevent ferrets from trying to dig out through the carpet under doors, you can place a plastic chairmat (can be trimmed to fit), thin plexiglass, or linoleum under the door (but watch for chewing on these). Windows - Make sure any accessible windows are closed when ferrets are out. Ferrets can easily bite through window screens. Toilets - Drowning danger. Keeping ferrets out of the bathroom is safest overall, but definitely keep toilet seats down. Ferrets may try to get a drink and fall in. Standing water - Similar to toilets, a sink, tub, or even bucket of water poses a drowning risk. Cleaning supplies - Most cleaning chemicals are toxic or dangerous to curious ferrets. Keep strictly out of reach. Cupboards - Most ferrrets will easily get into your cupboards. Invest in the magnetic type of child proofing locks for cupboards (most of the plastic locks allow the cupboards to open a bit, which is enough for most ferrets to get in). Electrical cords - Encase in plastic tubing to prevent chewing. Knick-knacks - Make sure breakable or delicate items are out of reach, and that there are no heavy items that might fall or be pulled over onto your ferret. Bookcases and High Tables - Ferrets like to climb up and on things, but often can't climb down. However, their lack of fear will often make them try jumping even from heights, make sure there is no high furniture to get stuck on. Garbage - Securely cover or keep out of reach. Chewing and Ingesting - Watch for things that your ferret might chew and swallow - especially things like foam, soft rubber or plastic, styrofoam, sponges, rubber bands, pen caps, cotton swabs, fabrics, and so on. Remote control buttons are a favorite target. Fans, Space Heaters, Candles, Fireplaces - Keep ferrets away from these. Toys - Check periodically to make sure they are not being dismantled and eaten.